Relaxation As per Delhi High Court Rules. Education Qualification : Passed LLB Degree From any Recognized University and Approved by Bar Council of India. 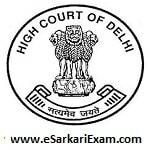 Eligible Candidates can Submit Delhi Judicial Service Exam 2018 Application at the Official Website of Delhi High Court latest by 22nd December 2018. Click on Delhi Judicial Service Examination 2018 Advertisement Link. Now Open Online Registration Link of Delhi Judicial Service Exam 2018. Register by Clicking Fresh Candidate Login Link.